We can supply Direct Thermal or Thermal Transfer Label Printers to print self adhesive Shelf Edge Labels in a wide range of labels sizes with a permanent or peelable adhesive. Labels can be supplied in plain white, colour washed or pre-printed with your artwork for over printing on a suitable label printer. 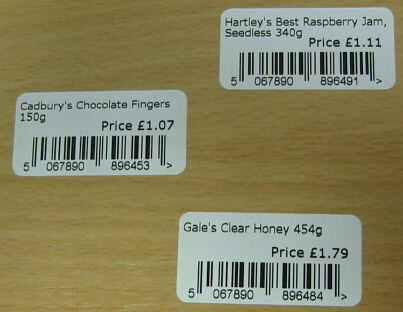 For printing shelf edge labels we can recommend the Kroy 4452 Thermal Transfer/Direct Thermal Printer - Shelf Edge Labels can be supplied in Direct Thermal or Thermal Transfer materials in various sizes and can be supplied on Rolls or Fan Folded with perforations between the tickets. Can be supplied plain white, colour washed or pr-printed with your artwork for over printing. The Kroy 4452 printer can also print to continuous rolls of Thermal Transfer or Direct Thermal Media when fitted with an optional cutter. We can also supply shelf edge labels for many other makes of printers including Boca, Citizen, Datamax, Datamax-O'Neil, Godex, Intermec, Kroy, Sato, Star Micronics, Stimare, Toshiba TEC, TSC, Wasp, Zebra printers. We can offer Software for Windows 7/8/8.1/10 to create and print Shelf Edge Labels printing Barcodes, Product Description/Size, Price and other details as required.